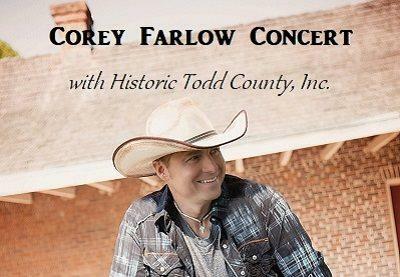 As it continues its fundraising efforts to generate more monies for the 1835 Todd County Courthouse Rehabilitation Project, Historic Todd County, Inc. approached Corey Farlow, well-known local country music artist, about a possible fundraiser to assist HTC in its fundraising efforts for the second floor of the Courthouse. The event, which will be held in the TCCHS auditorium, is scheduled to begin at 7 p.m., and the show should last about one-and-half hours. Tickets for the event are $10 for folks six and above and are available via Laura Brock, Carolyn Wells, or at the door on March 2. To make it easier to purchase tickets, HTC has also added a ticket link both on its Facebook page and on its HTC website. To handle the expenses of purchasing tickets online, those tickets are priced at $12. Folks familiar with Corey’s name will recall Corey was named “2016 Inspirational Country Music Association’s (ICMA) Best New Artist of the Year,” and he also received an ICMA Award for his #1 song entitled “Strong,” a song that remained on the ICM Powersource Chart for four weeks as well as the Christian-Country Weekly Chart for five weeks. The song, one that relates the story of friends close to Corey who have battled cancer, is one that also reflects the lives of many who fight a daily battle with the dreaded disease. Another of Corey’s hit songs is entitled “Rebels,” another song voted the #1 song requested nine nights consecutively on the Clarksville radio station “WVVR.” During that nine-day stretch, “Rebels” beat out other notable artists including Blake Shelton, Dierks Bentley, Keith Urban, Eric Church, and Carrie Underwood. Described as an artist from the ‘hollers of Kentucky,’ Corey recently signed a music contract with Big Catch Records. Again, for those who know Corey, many will recall that Corey’s father and grandfather are both musicians, and Corey is also the nephew of George Morgan and a cousin to Lorrie Morgan, both well-known country music stars. When asked in a recent podcast what he considered important for an artist to remember, Corey replied, “Country music is a political game; it requires an investment in self along with a belief in self.” He also commented that music runs in his blood, and he wants to reach people using that popular venue. Corey, who was raised in the Nashville area, has shared his music at the Grand Ole Opry, the legendary B. B. King’s, and Nashville’s CMA Fest, and he has also been a studio guest for country radio star Devon O’Day and GAC host Nan Kelley. Noting that folks are always interested in an activity to please all ages, Billy added, “Since we have begun our efforts with the rehabilitation project, HTC anticipates this event as another one that will add more monies to cover the cost of the second-floor project.” Billy shared that HTC has already submitted a Pennyrile Area Development District (PADD) grant; however, at this time, the grant has not been approved. He is hopeful, however, that the grant will soon receive a stamp of approval, and the rehabilitation project can move forward as planned.